Deseree Cain-Arzu ’16 (communication and media technologies) from Belize, left, and Lily Cisco, third-year molecular bioscience and biotechnology student from Livonia, N.Y., participated in last year’s ROAR Day. ROAR Day at RIT is set to kick off this Wednesday, Oct. 5, for the 11th straight year. 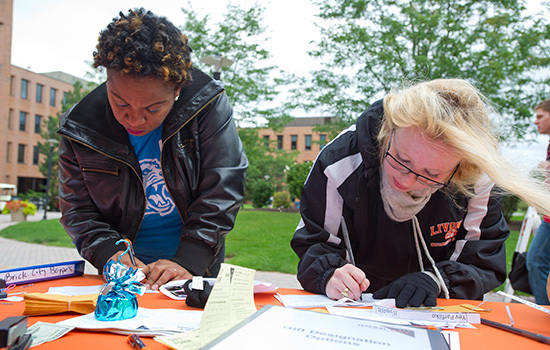 ROAR Day is a 24-hour window during which students, faculty and staff are encouraged to give back to their favorite area of RIT. Last year’s event brought in over $123,000 in direct support to RIT programs with more than 2,400 students, faculty and alumni donors. Brenna Mangano Hynes, the associate director of The Fund for RIT, is the organizer of the event. She said that ROAR Day provides a unique opportunity to teach and encourage philanthropy on campus. What makes ROAR Day unique is the incentive to give back on that day. For one day only, every student, faculty and staff gift between $5 and $40 (up to $40,000 total) will be matched by private donors. Gifts over $40 will receive a $40 match. While RIT tuition covers approximately 50 percent of the cost of operating the university, contributions from alumni, parents and friends account for the rest. Amber Webb, associate director of marketing and communications for Development and Alumni Relations, said that what most students don’t realize is that giving participation rates are one of the key factors that play into national college rankings. The national average of alumni giving is around 17 percent. At RIT, the average is only 7 percent. Mangano Hynes went on to say that gifts can be made to RIT’s areas of greatest need, or can be directed to a club, organization, scholarship or academic department of your choice. Gifts can be made at tables around campus from 10 a.m. until 3 p.m. Oct. 5 and will be accepted in the form of cash, credit, Tiger Bucks and payroll deduction. Contributions can also be made online between 12 a.m. and 11:59 p.m. on the same day.